*SPOILER*--------------------THEORY: Main Character "Player" could possibly be Ventus? Hi. I am kinda new here but I really wanted to post this theory. Okay, so I think that the main character in unchained key, as in the player, could possibly be Ventus. It sounds crazy but I have some reasons as to why I think so. Below is a picture of the card released for the 3rd Anniversary of Chi. Now look at where Ventus is. 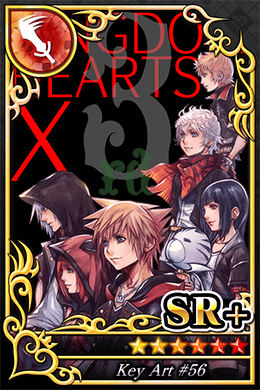 First of all, why is Ventus, of all characters, on this card? Second of all, why is he standing closer to Ephemera and Skuld and not close to Sora. Could it be he has a deeper connection with Ephemera and Skuld? What's even more strange is that Ventus isn't in his usual attire (I don't know what to say about his clothing but he is suspiciously close to Ephemera and Skuld). And why Ventus, of all the Kingdom Hearts characters? Isn't it suspicious that we don't know about his past before he met Master Xehanort, heck we don't even know they met! What if his hidden past is related to Skuld and Ephemera. The only person we see in the game interacting with Skuld and Ephemra in the game is the Player. Other NPC's mention they know of Ephemera, but none of them actually claimed to be his friend. And two of these Chirithy belong to the Player. So why is Chirithy there? Well, if Ventus was actually the Player, then the presence of Chirithy would be more understandable...But then why would Skuld be holding Chirithy? Well, that can be explained too. The Player's Chirithy seems to take a liking to Skuld as she is the Player's friend, and is seen talking to her quite often, so that would explain why Skuld could be holding Chirithy. Dive to the Heart is quite a significant location in the Kingdom Hearts Series. It's the first place you play in in Kingdom Hearts 1. Ventus's Dive to the Heart is also known as his mind. A character's Dive to the Heart usually contains images of loved ones and the background contains the persons birth place. Strangely enough, it seems Ventus has come from the Keyblade Graveyard. Even more important, look at the first station. You'll notice that the Keyblade Graveyard, or Daybreak Town so to speak has no keyblades on the ground and looks very empty. You'll also notice the circle where his loved ones were supposed to be are filled with a pattern. Now look at the one with Vanitas. You'll see that in the Vanitas Version, there are actually keyblades on the ground and he place isn't very empty looking like the previous station. This has a good explanation. We can assume the first one was empty because the player fights in the Keyblade War, and so the player was more focused on blocking the incoming foretellers. Yes, the player did see the damage done, but by the time the place was actually full of keys, they were dying/sleeping. With Vanitus, it's different cause he's born years later, so by the time he's born in the Keyblade Graveyard, it's full of keys. Also, the darkness that Vanitus possesses may have provoked the memory of the scattered keyblades. The point is, VENTUS WAS BORN IN DAYBREAK TOWN! Xehanort found Ventus and apparently tried to train him. He was so desperate to make Ventus his vessel that he was patient with Ventus whenever he failed miserably. But Xehanort is not the kind of person who does things out of kindness. Obviously there is something to gain from making Ventus his vessel or even the hassle of taking care of an almost braindead Ven. So what if the thing to gain was information? About the lost masters (Foretellers), the keyblade war and possibly even Kingdom Hearts. What if some of this information was gained through Ventus? As far as we know, the only character who gets to live past the Keyblade War and possibly saw Kingdom Hearts is the player and Luxu. Now Luxu could've gone on to train the person who will train Xehanort and Eraqus, so that may be how Xehanort found out a little about the lost masters. But the player survived, and they seem to be forgetting a lot about their past, so what if, Xehanort found the Player as he travelled to the other worlds and the Player blurted out something about the Keyblade war as they were losing consciousness, which piqued Master Xehanort's interest? And that player could be Ventus, and would explain why Xehanort is going to such lengths as to even separate Vanitus from Ventus in order to make a vessel out of him. I've heard of this hypothesis before...but idk. Usually if a character is a character, Nomura has you play as them to see their story. Why would Nomura suddenly decide to allow the player to make Ventus as a girl or dress him up in different clothes? It just feels like that's way out of line with how Nomura usually does things. All I can think with this hypothesis, is we the players are inside Ventus's memories of the keyblade war, that's why we can choose how we look... we're kinda acting like how Sora was with Ventus when he was little, filling the void in his heart. Edit: Actually I'd like to retract my last statement... if we were simply looking at Ventus's memories, the characters we interact with wouldn't take our avatar's gender into consideration... using her and girl. They'd simply just use male terms, as they would be talking to Ventus, not us. Idk, it's weird. I've heard of this hypothesis before...but idk. Usually if a character is a character, Nomura has you play as them to see their story. Why would Nomura suddenly decide to allow the player to make Ventus as a girl or dress him up in different clothes? Have you ever heard of the term False Protagonist? basically, it's a character that's designed to be a primary character, when it reality, they're a side character (or an antagonist). There's a hint of False Protagonist showed by the credits of Kingdom Hearts X. The character is never present in any capacity (not even a canon character model), instead, Skuld and Ephemera take their place. Taking the False Protagonist element into consideration, it's completely possible that Ventus is indeed the player character. The only reason as to why Ventus isn't playable is simply because it's a major plot twist of Kingdom Hearts X... and it's an excuse to have a customisable character in the Kingdom Hearts series. As much as I love these theories, the awakenings in the RoS do not match up sadly. As the Player wakes up in Enchanted Domain in present day with Maleficent being inside that world also, while Ven was inside for about 10 years without a Chirity. Though, nothing in Kingdom Hearts is an accident. But I do like this theory quite a bit, while the times don't line up. That is really the only big loophole. Well this has been metioned before. It actually isn't cofirmed wheter the Keyblade Graveyard is Daybreak Town, or a part of Daybreak town, or a completely other world. And I don't think he was born there (or in Daybreak Town for that matter). The Badlands looks uninhabitable, with all it's tornados and no plants growing or anything. We don't see any traces of Civilization. I think the reason his station shows the Badlands is because he spent the better part of his life there. Or, the better half of the life he remembers he spent there. Like you said, Dive to the Heart represents his mind, and how much of your life do you remember before you were 7? It's safe to say that it takes a while to summon the mightiest weapon in the universe at a childeren's age. When Xehanort made Vanitas he trained him in the Keyblade Graveyard. This also explains why Vanitas could manipulate and ride all those Keyblades with ease during the battle. That's why his station shows the Keyblade graveyard. So no, I don't think it was because Ventus was born there, I think it was because he spent the better part of his life there. Actually he wanted Ventus to unleash his Darkside so he could forge the X-Blade. He didn't want him as a vessel (yet). As for his patience, I can imagine that finding a Heat with so much Light is quite hard. So if he would screw up this chance he would have to spent a long time travelling to a whole lot of other worlds to find such a heart again. Also, who doesn't love Ventus? It'd be a way to make me like the fact that (Unchained) X is relevant to the plot at least a bit more. I wasn't too happy about that, but I'm not gonna lie, Ventus is one of my favorite characters and I've always been wondering if we'd ever be told where he originally came from or how/when MX found him exactly and under which circumstances. So there I stood, with vast knowledge in one gnarled, dying hand, and newfound purpose in the other. The next step was clear: I needed a new vessel.And that was when I met Ventus and made him my pupil. We were destined to meet, and I could sense the potential within him, but the boy was too benign for his own good. I came to the conclusion he was too frail to serve as a vessel, and decided to use him for a second purpose I had in mind. I would remove the darkness from his heart and split him in two. Then I would have my heart of pure light, and my heart of pure darkness. This theory I would like to see being true. It definitely would explain a lot if it was. It also explains why he was reluctant to kill heartless, as feelings of his past made him uneasy because of what happened.